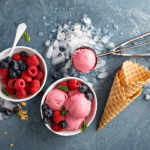 A low carb keto double berry ice cream recipe everyone can enjoy, even if you’re not on a keto diet! The texture is creamier and the taste is richer and you won't be able to stop eating. Partially thaw frozen strawberries, if using. Mash strawberries slightly to break up; set aside. Transfer the mixture to a 4-5 quart ice cream freezer; freeze according to the manufacturers directions. If desired, ripen. Makes 2 1/2 quarts, 20 (1/2-cup) servings. You can substitute sugar in this recipe with natural sweeteners such as Stevia, Xylitol, or Erythritol.